Recently, we, at the GoodNews Notebook, learned about a wonderful father who is doing “Good” as an answer to his grief. Roger Leggett lost his son to a heart attack and now helps his granddaughter, Felicity, who has pediatric cancer. But, he is making a difference in the lives of many as he travels through this heart-breaking journey. According to his Facebook Page, Chad’s Bracket (https://www.facebook.com/ChadsBracket), while visiting his cancer-fighting granddaughter, Roger noticed several families having difficulty transporting their children—and their medical equipment—through the hospital. So Roger enlisted help from several local organizations to create a device that safely connects I.V. poles to our red wagons. Did he stop there? Nope! Earlier this week, Roger delivered 20 brand new wagons. Wow. 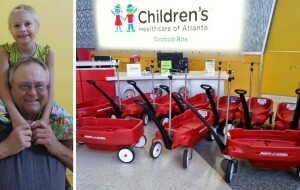 Since that moment, Roger has partnered with WellStar, Children’s Healthcare of Atlanta hospitals, Tanner Medical Center, and even the Hiram Police Department to sponsor and deliver these “red wagon miracles” to some of the most amazing children. The origins of Chad’s Bracket are as bittersweet as any history could possibly be. After a week of severe headaches and vomiting, on Friday, April 22, 2011, Felicity Withrow was diagnosed with a brain tumor. An MRI on Saturday, April 23 confirmed that it was a 3cm by 2cm ependymoma. Felicity had surgery on Monday, April 25, 2011 to remove the tumor. While it may seem like a brain tumor diagnosis and immediate surgery was the worst possible scenario, Felicity’s family would soon learn that heartbreak could run much deeper. During the surgery, doctors discovered that they had to leave a small 4-5mm portion of the tumor that was on her brain stem and could not be removed. This was unexpected, and it meant a change in the chemo plans. What followed was a roller coaster of medications and MRIs and then, another surgery when an MRI showed that the tumor had returned before even the first checkup scan following the first surgery. Even with these events, there were many blessings from God along Felicity’s journey, including on September 6, 2014 when Felicity had her first completely clear MRI. During one of the many visits to see Felicity in the hospital following that first surgery, Roger Leggett (Felicity’s grandfather, a firefighter and now-retired expediter at Lockheed Martin) and Chad Leggett (Felicity’s uncle, an Emergency Medical Technician) encountered the mom of a patient entering an elevator. That mom was using a wagon to transport her child while also attempting to move an IV pole along with that wagon. Roger and Chad noticed that the mom was having such a difficult time that the IV pole almost fell on her child. They knew immediately that there was a need for some way to attach an IV pole to those wagons so that parents would be able to utilize the wagons in an easier and safer manner. Tragically, just a few weeks later Chad passed away from heat stroke at one of Roger’s and Chad’s favorite hunting sites. In the weeks to follow, heartache flooded the family, faith was shaken to its core, and despair was evident to all who surrounded the family with love and support. The family was torn between celebrating Felicity coming home from the hospital and the new baby, Felicity’s little sister, who would soon make her debut, and the sorrow that threatened to take over. But through it all, one thought remained in Roger’s mind: Chad’s legacy. Chad wanted to create an IV pole attachment for those wagons, and would have wanted Roger to continue on that course without him. That thought sustained Roger while he set out on his mission to develop Chad’s Bracket. That mission included collaboration with Children’s Hospital of Atlanta engineers to check every safety concern, guaranteeing that the wagons were safe even with the weight of a pump and IV bags attached. These measures included using wagons with seat belts, with wheels on the outer perimeter, and that have a low center of gravity. Also included in the process were Lewis Holland, Grant Little, Dave Taylor, and the welding class at Chattahoochee Tech in Jasper, Georgia, as well as L&W Welding in Paulding County. Their participation was crucial in bringing Chad’s Bracket to life. Organizations such as the Masonic Lodges in Douglas County, Heard County, Carroll County, and Paulding County (all in Georgia), Georgia Heritage Bank, Grand’s Convenience Store (Dallas, Georgia), the City of Hiram, Georgia, and many others (including individuals we are not specifically naming in order to protect their privacy) have donated money to place wagons specially fitted with Chad’s Bracket into specific hospitals, including Children’s Healthcare of Atlanta facilities, Wellstar Paulding Hospital, and Tanner Medical Center facilities. Requests have begun coming in from hospitals and organizations in other states as well, and Roger is working quickly to determine how to best meet those needs.